Apple today updated its website to add a holiday gift guide, recommending Apple products for people to purchase for friends and family this holiday season. This year's gift guide is bedecked with tiny people and Apple devices displaying holiday scenes. The flagship iPhone X, priced at starting $999, is front and center the gift guide, with Apple also highlighting the Apple Watch Series 3 models, the iPad Pro, the MacBook Pro, and the 4K Apple TV. Accessories for each product are listed below each item, with Apple recommending things like AirPods, iPhone X phone cases, Apple Watch bands, the Apple Pencil, Beats Studio3 headphones, and more. Several third party accessories are also shared on the page, including Sphero's R2-D2 robotic droid, a new DJI Mavic Pro in an exclusive Alpine White color, the Lifeprint Photo and Video Printer, Belkin's Boost Up Wireless Charging Pad, and the CliqueFie Selfie Stick. 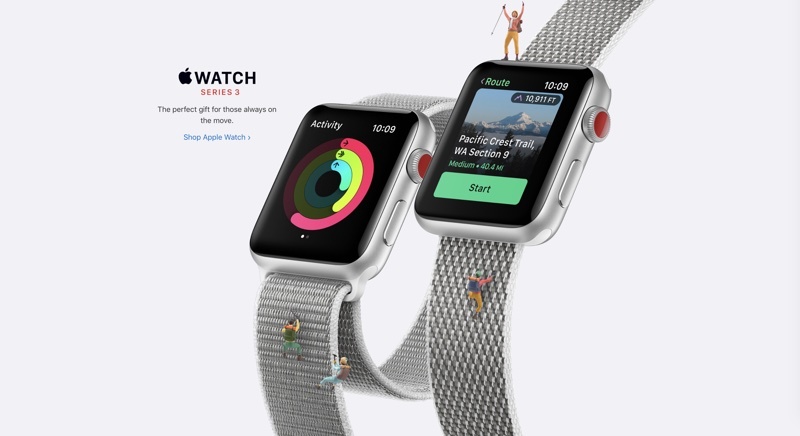 Even more accessories are highlighted in a separate "More Gifts" section, with Apple sharing suggestions on accessories at a range of price points and for several different ages. Every year, Apple offers an extended return period during the holidays, and as of today, the new return period is in effect. Most products and accessories purchased between November 15 and December 25, 2017, will be eligible for return until January 8, 2018 in countries that include the United States, Australia, the UK, Canada, Germany, France, Sweden, the Netherlands, Hong Kong, and Japan. Apple also offers free two-day shipping on all purchases. Apple will likely be offering a Black Friday sale on Friday, November 24, so if you're planning to buy an Apple product from Apple, it could be worthwhile to wait. Last year, Apple offered customers free Apple Store gift cards worth up to $150 with the purchase of select products. What they need to share is that iPhone wallpaper. Kinda weird that this is predating the HomePod no? Apple and black friday , don't really go together. Getting 50$ off or some gift card is of no use, because when the tax gets added that part gets nullified already. At any rate, guess it's something better than nothing. But, just saying it's not really much of an incentive to go rushing to buy something. Spend $2700, get $150 (that you can only spend with Apple). Yeah sure, Apple "shares" 2017 Holiday Gift Guide in the same way customers "donate" to Apple Store. Why would Apple need to give huge discounts on products? They have no problem selling their stuff. They forecast to sell nearly $1 billion a day in their holiday quarter. It's not about an issue selling their products. It's their Black Friday deals aren't really all that competitive. Nor are you really saving a lot of money by receiving a gift card that you pay full price for a product to begin with. Most are in the market for Black Friday to find heavily discounted products that normally would retail at full value. The gift card is just a bonus if it comes with it. Typically it's A Product (MacBook, Apple Watch, iPad) you have to purchase at full price to receive the gift card. I found last year's Black Friday deals from Apple lackluster. Most third-party retailers will have much better incentives and sale prices than Apple will offer. But nonetheless, I always like to see what they have to offer. Loving the mini-persons. Really digging this campaign! Their campaigns have been pretty dreary samey for about a decade. (oh Mac vs PC, you were so enjoyable yet contentious). This one actually made me smile. At this rate that’s how big the iPhone will be in a few years. They tricked you - its not bigger it's just closer. I actually upgraded my 6 to a 6+ just by holding it closer to my face each time. It just works! What's your wife going to do with 10 Lightning cables?! I guess Apple wants us to buy a Headless Windows Desktop since the Mac Pro/Mini are ancient by tech standards.